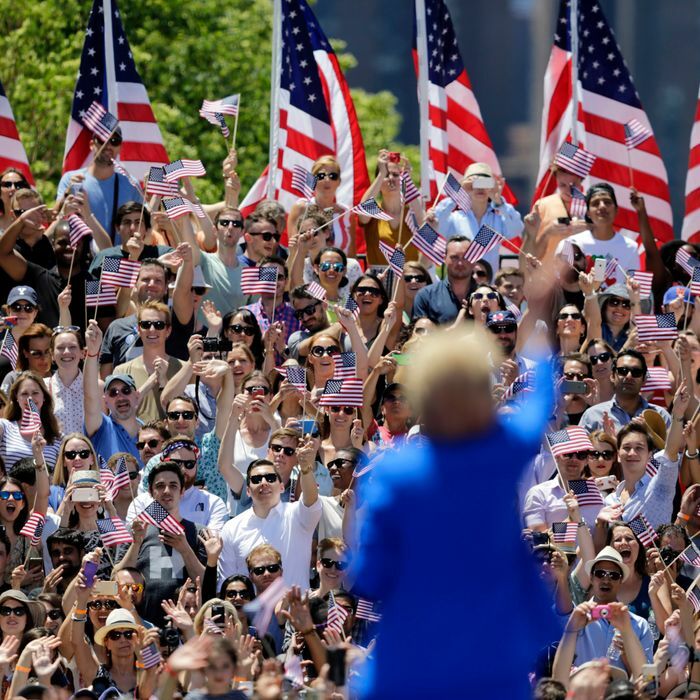 Hillary Clinton waves to supporters Saturday, June 13, 2015, on Roosevelt Island in New York. Photo: Frank Franklin II/AP/Corbis/© Corbis. All Rights Reserved. The speech fit with the theme of Hillary’s first announcement video, which was built around the stories of ordinary Americans preparing for big changes in their lives. It barely featured the candidate at all — the overarching message being, “It’s not about me. It’s about you.” But it was not the speech the campaign hyped in the New York Times and Politico yesterday, in stories previewing how Clinton would use the theme of her mother Dorothy Rodham’s life — one of personal hardship made tolerable by the generosity of others — as the narrative grist for explaining what motivates Clinton to fight for everyday Americans. After Clinton’s grandparents divorced, they sent an 8-year-old Dorothy with her baby sister on a train trip across the country to live with their grandparents. The living situation was not much better. Dorothy’s grandmother was a severe woman in Victorian dresses who once forbade Clinton’s mother from eating at the dinner table for a year after catching her trick-or-treating one Halloween. At 14, Dorothy fled to work as a nanny and housekeeper for a family that paid her $3 a week plus room and board. For the first time, she saw what a functional family looked like. After graduating high school, she planned to attend college, and her mother lured her back to Chicago with the promise of help paying for school. But when she arrived, she realized her mother only wanted her there for household help — there would be no money for school. “Heartsick, she moved into a small apartment and found an office job,” Clinton writes. Not going to college would be among her greatest regrets. It was a touching theme in the book, but it didn’t really come across in the speech — maybe because Clinton wanted to keep her personal touches light. “I may not be the youngest candidate in this race, but I will be the youngest woman president in the history of the United States,” she said. “You won’t see my hair turn white in the White House, because I’ve been coloring it for years!” The crowd ate it up.